Are you active, but finding it difficult to recover from workouts? Do you have irregular cycles or thyroid issues? Women experience cycle irregularity, weight loss resistance, poor exercise recovery, altered sleeping patterns, cycle-related issues like water retention and bloating, stress, thyroid and adrenal dysfunction. Women also deal with headaches and cramps during the month. Women on keto diet plans often report brain-consuming cravings, storing more body fat than men and having a difficult time digesting certain foods. To make things worse, sometimes going too low carb disrupts the healthy balance of female hormones, leading to weight gain or worse – the dreaded diet stall. Stop your stall by modifying your low carb plan for the female physique. Eat with your body, not against it. These changes are easy to do – and taste delicious! During certain times of the month or during hormonal fluctuations, some foods may be uncomfortable to eat and digest. Hard, starchy veggies and dense, heavy meats are off the menu. Swollen, puffy stomachs don’t handle heavy meats well. Stick to lighter proteins like chicken, seafood and other white meats. Eat a little less protein. If you’re having trouble losing weight or reaching ketosis, try reducing your daily amount of protein. Instead, eat broths and soups, or softer low carb veggies around hormonal times. PH levels are especially important for women’s reproductive health. Eat low carb yogurt with lactobacillus acidophilus to balance pH naturally. Dannon’s Light & Fit diabetic-friendly vanilla yogurt has only 3 grams of net carbs per cup. Omega 3 balances the Omega 6 from all the fats we eat on low carb and keto diets. Take a dietary supplement, or add high Omega 3 whole foods like flax and macadamia nuts. Flaxseed is a rich source of Omega 3 fat. Flax seed is very high in fiber, vitamin E and magnesium. Flax seed is often ground, milled or used to make oil. Add metabolism-boosting fats like coconut and MCT oils for sustained energy and rapid fat-burning. Carrington Farms Organic Coconut Oil is essential for rapid fat-burning. Fats from coconut oil aren’t stored. Instead, coconut oil is used immediately for energy. Add MCT oil to salads, smoothies or coffee for all-day energy. The Keto Beginning program goes a step beyond the usual low carb approach. 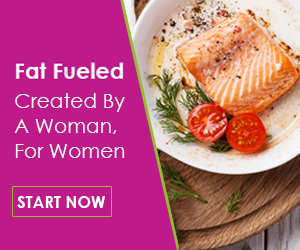 This keto meal plan offers an allergen-free, paleo-friendly, low carb, hormone-balancing solution for women. This plan does all the prep work for you, using sound nutrition practices and vibrant foods to create high fat recipes that are also dairy-, gluten-, sugar-, grain- and legume-free. The Keto Beginning is a sensible program focused on women’s health issues: lasting weight loss, hormone regulation, balanced mood and increased energy. Boost your body’s ability to heal. Bust through plateaus without feeling restricted or deprived. Maintain steady energy without relying on constant feeding. …this is your chance to empower your body, meet your goals and achieve the balance you’re searching for. Rapid weight loss may lead to sagging skin. Muscle-building workouts and firming exercises like push-ups and squats, shape and tighten problem areas fast. Two or three days each week, do push-ups while playing your favorite song. This works better with happier songs. Bust out a few casual squats while waiting for your coffee to brew. Go slow and low. Perform a quickie set of squats during lulls while cooking stove-top. Go fast and furious. Do a round of squats and push-ups during the commercials of your favorite TV show or podcast. Pull back on the dairy and cheese. Some low carbers stall while eating these. If you must eat dairy, limit yourself to 4 servings per day – max. Spend a week or two without your beloved higher carb nuts, nut butters and legumes (beans, peas). These delicious little devils are easy to overeat and are known stallers. Comfort yourself instead with controlled, measured portions of walnuts, pecans, almonds or macadamias. Women crave more furiously than men, especially during hormonal days. These solutions are loaded with nutrients, healthy fats and are keto-friendly. Solve your salty craving: Whip up a creamy hummus that’s super low carb and high in fiber – using macadamia nuts! This high fat nut hummus tastes and feels like traditional, chickpea-made hummus, but without all the carbs. Solve your sweet craving: This creamy dark chocolate mousse is incredibly easy to make, works as a fat fast recipe and has almost no carbs. Yum. Land O’ Lakes sugar-free whipped cream is made with real heavy cream and is almost zero carb. Cool Whip also makes a heavy cream version that’s super low carb. Enjoy a handful of dark chocolate chips or cocoa nibs. Brands with higher-quality dark chocolate usually have the least amount of carbs. Organic Raw Cacao Nibs are “nature’s chocolate chips.” They boast a strong, raw dark chocolate flavor. Cacao nibs are one of the most plentiful sources of antioxidants and magnesium. Raw cacao is high in fiber, iron and essential minerals. Snack on these sweet, dark nibs or use them in recipes instead of sugary milk chocolate chips. Solve your salty-sweet craving: Sometimes, we crave everything: salty, sweet, creamy and crunchy. A nutty dark chocolate break-apart keto bark does the trick. Salted dark chocolate no-bake fudge whips up in minutes. Each large piece has only 2 net carbs, crunchy buttery nuts and subtle coconut undertones. Shake up your metabolism! Women often restrict calories too much on keto diets. Ketosis suppresses appetite. Sometimes we don’t realize we’re not eating enough. Plan a few cheat days for eating slightly higher carb. Eat slow carbs and stay under ten grams of net carbs per hour to avoid insulin spikes. Think “nutrition” – not calories. Add fat, vitamins and antioxidants directly from raw foods – without adding calories. What is this sorcery? A refreshing kiwi cucumber smoothie balanced with just enough fruity sweetness. This smoothie is icy, extremely filling and has only 50 calories. Many women do well on keto diet plans and experience dramatic weight loss. However, after a while, weight loss may stall. At some point, keto doesn’t seem to work anymore. If you aren’t eating enough calories or if you’re going too low in carbs, you could be influencing leptin’s ability to regulate hormones. Leptin maintains proper female hormone levels. Insulin influences leptin, so dramatically cutting carbs dampens your body’s leptin levels. Going too low in carbs and calories sends a stress signal to your metabolism. Your hips and tummy grab the fat and hang on tight. If you are very active. During pregnancy and while breastfeeding. If you have trouble recovering from your workouts. If your thyroid is under-active, even with a keto diet or support from medications. If you have adrenal fatigue. If you are near menopause or have irregular cycles. If you’ve been eating very low carb for an extended period of time. Lower isn’t always better when it comes to carbs and women. Going too low in carbs can create hormonal havoc and encourage diet stalls. If you’ve been eating a very low carb or keto diet for an extended period of time, you may benefit by increasing your carbs a few days per week with carb cycling. No – carb cycling is not eating candy on a bike. Carb cycling means eating more or less carbs, rotated in a specific way. The Keto Beginning plan uses carb cycling to naturally restore weight, hormonal balance and mood. The Keto Beginning is designed specifically for women’s bodies – to promote greater fat loss for the female metabolism. Cycling higher and lower carb days is a powerful tool. The Keto Beginning is a highly recommended program – especially if you’re not ready for Atkins Maintenance phases or an increase in carbs every day.